Evil Inc » Support the Kickstarter for Evil Inc Vol. 8! Support the Kickstarter for Evil Inc Vol. 8! For those of you asked about the next Evil Inc graphic novel, here’s your chance to help make it happen. I’ve launched a Kickstarter campaign to fund the printing of the next Evil Inc graphic novel! If you haven’t seen an Evil Inc graphic novel, let me explain. Instead of doing the usual collection of comic strips, the Evil Inc graphic novels use the individual panels from those strips to layout comic-book-style pages. 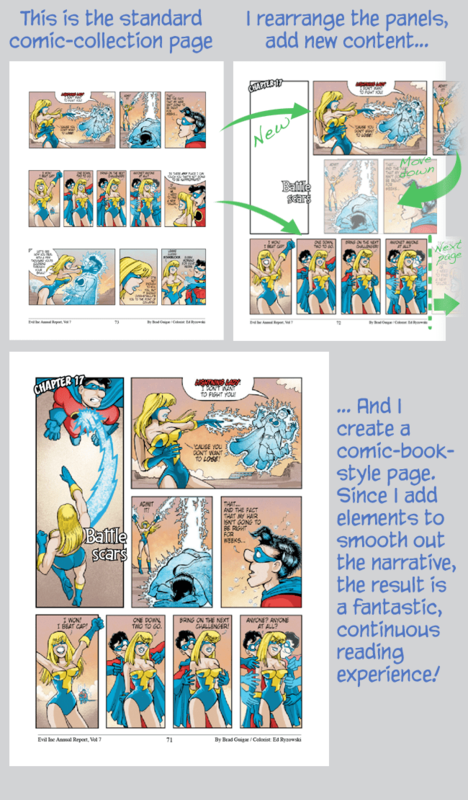 Throw in some never-before-seen panels and other content, and you have an entirely new reading experience! And rewards? I think you’ll find a lot in there to like. Of course, you can get the book and a DRM-free PDF to read on your digital tablet. But you could also get fantastic multiple-book packages, Artist Editions, original art and much more! There’s a complete breakdown below. When you’ve finished looking it over, go over to the site and select your reward level. And then — by all means — help me spread the word! Tweet, post on Facebook, reblog on Tumblr… it all helps in a massive way! Thanks for your support, and now let’s get to work!